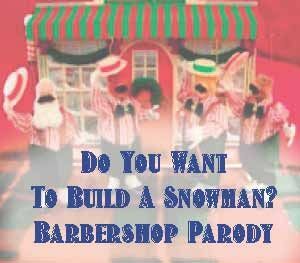 This is a fun and simple TTBB Barbershop Quartet parody of Disney’s “Do You Want To Build A Snowman”. CONCEPT – The lead wants everyone else in the quartet to go out and build a snowman. The others think he is crazy and childish. But after noticing that his feelings are hurt “Okay bye”; the others decide to come along side of him. The lead takes it too far with the “ride the bikes around the mall”. But alas the others do decide in the end to help build their friend’s snowman. This uses simple interactions from the quartet. Total time is just over 2 min. Key of G. See the sample score for full lyrics and score excerpts.